It’s finally spring, and that means it’s time to shed those bulky layers and brighten up your wardrobe! Luckily, there’s a plethora of amazing pop-ups and shopping events this month to help you do just that. Few things warm my heart like a great collaboration, and this one brings three talented designers together in an unexpected way. While Liza Rietz takes a seven-month sabbatical, she’s handing her eponymous brick-and-mortar store over to a rotating roster of local artists in a “temporary pop-up shop experiment.” First up: clothing designer Rachel Ancliffe of ANCLIFFE and jewelry designer Lauren Main of REVERE. Ancliffe has been on the Portland design scene for almost two decades, working for big companies like Nike and Adidas and heading up two independent design companies, Institute of Dress and Charles & Victoria. (I often wear a beloved tuxedo jacket from the latter.) In 2014, she started ANCLIFFE, an affordable luxury women’s wear line aimed at empowering women through refined and reinvented classics. In seasonless styles made in limited quantities and often hand-dyed, ANCLIFFE pieces are always unique. REVERE’s Main began her love affair with jewelry at her mother’s custom jewelry store outside of Chicago. “There is something so magical about melting down raw metal and transforming it into a piece that will become part of someone’s identity and a future family heirloom,” she says. REVERE’s pieces are hand-made in Portland, and often incorporate recycled silver and gold and ethically mined stones. 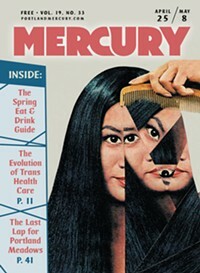 Be sure to visit portlandmercury.com for a complete guide to style events. Got a fashion event? Drop us a line at fashion@portlandmercury.com.